Stacy began teaching in 2002 in New York City. She grew up in South Carolina with parents of Brooklyn pedigree. When she graduated from the University of South Carolina, she moved to NYC. After a year of working in the fashion industry (in publicity, not fashion) she went and received her Masters at Teachers College, Columbia University. She student taught at PS 321 and taught at PS 94 in Sunset Park. She has been at PS 261 since 2007. Nadya has been teaching at PS261 for over 10 years. Raised in Brooklyn, she lives here in NYC with her family. student blog: steach4fun.blogspot.com teacher and parent resource blog: steach4funresources.blogspot.com website: steach4fun.com Ms. Scarborough came to PS261 in 2006. Born and raised in Long Island, NY she spent 10 years teaching in Florida before moving back to NY and settling in Brooklyn. 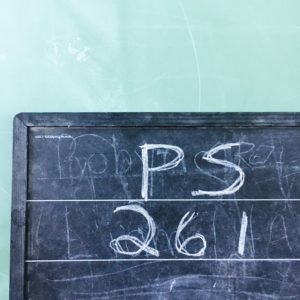 In her ten years at PS 261, she has taught both third and fourth grade and one year as the school’s art teacher. Ms. Scarborough thinks that the kids, the parent community, and the shared learning experiences are exceptional at PS 261. She teaches her students the importance of building community and empathy for others and sharing and defending our thinking in the pursuit of growing as an individual and helping our world. She has a B.A. in Psychology from UCF and a Master’s in Teaching from Rollins College. She has a daughter, Cody and a guinea pig named Ginny. For fun she enjoys spending time with her daughter, visiting museums, reading, cooking, watching science fiction, bird walking, and sculpting with paper-mâché. Ms. Jillian is new to the PS 261 community this 2018 – 2019 school year. She was born and raised in Los Angeles and moved to Boston to study and work in documentary filmmaking. Upon moving to New York and continuing to pursue film, Jillian realized that she didn’t want to promote social change through the lens of a camera, but to empower students to tell their own stories and realize their own abilities to influence their communities for the better. Jillian completed her Masters in Elementary Inclusive Education from Teachers College, Columbia University and continues to be a learner and a critical thinker alongside her students. Kady has been teaching and working in education since 2000. 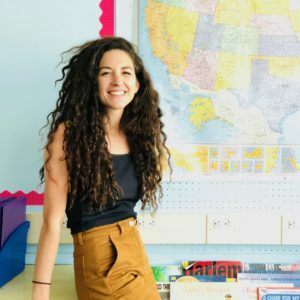 She is a Math for America Master Teacher and loves using investigations, number strings, and math congresses to bring mathematics alive for students. Kady holds a degree in elementary education from the University of Wisconsin, a bilingual certificate from Wayne State University and a master’s in special education from Bank Street College. She is passionate about social justice and equity in the classroom and loves seeing her students grow and learn together. Kady is originally from East Lansing, Michigan and loves going back in the summer to swim, waterski and spend time with family. She lives in the neighborhood with her husband and two daughters. 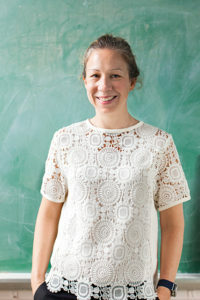 Susie began teaching in 2007 in Sunset Park, Brooklyn. She grew up in Brooklyn and attended PS 261. Susie has her Master’s degree in Museum Education and Childhood Education from Bank Street College. She is passionate about teaching social studies and believes that learning about the past will help our children be critical, reflective problem solvers. During her free time, she enjoys exploring the city, visiting museums, and traveling with her husband Omar, son Rio, and daughter Flora. Lindsay joined the wonderful PS 261 community in 2016. 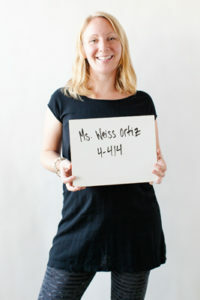 She received her Master’s in Childhood Education from Hunter College, and previously taught at PS 139 in Brooklyn. Lindsey is also a theater educator and directs for Piper Theatre Productions’ summer youth workshops. Prior to teaching, she worked as a writer and editor. As a teacher, Lindsey is passionate about helping children expand their critical thinking skills and explore issues of equity and social action. She lives in Brooklyn with her husband, twin daughters, and two lazy tabby cats.